I've learned to be much more patient and diplomatic over the years than I used to be, and this job has certainly made me practice these skills even more! That doesn't mean I'm an expert of course, and I'm frequently biting my tongue and faking politeness when dealing with some issues. But here's a few ways of trying to deal with stress. The tricky part here is finding a sympathetic ear, but often I find if I can have a good moan about whatever's bugging me, it lightens the load a little. Bottling up your problems often leads to them stewing and bubbling away inside, getting you more and more worked up and stressed out. Venting makes me feel much better, and sometimes the other person will be able to offer advice on the matter too. Swearing, shouting or throwing something can have the same helpful effect for me too, just be careful where you choose to do either of these! If you're feeling stressed about an overwhelming amount of work needing done, stop for a moment to assess it all. Sometimes people have a tendency to launch into several tasks at once, or keep switching between them. Make a list of all the things you need to do, and figure out which are the most important, and which can wait. This also breaks everything down into smaller, more manageable tasks, that will feel less overwhelming. A list can look big, but have several things that can be ticked off in ten minutes, if you sit down and take them one by one. It sounds obvious, and much easier said than done. But you have to take a break, or the stress just continues to mount up to unbearable levels. If necessary, force yourself to take time off by scheduling it into your day. There's times when I wish I had more access to my office, but because I don't, I have to go home, and while I might do a bit more work when I get back, I usually start to switch off on the journey back. I also look at what work can wait until the next morning, and then I can allow myself to have the evening off. Working and stressing about it all the time only makes you unhappy and unhealthy - everyone has to take time off sometime! Again, it sound obvious, but do it. When you feel the pressure and stress piling on, stop, take a beat, and breathe. Focussing on breathing for a few moments calms you down, and gives you a brief respite. While doing this, focus on positive things, and banish the negative. Then, when you're calm and clear-headed again, you can look back at whatever is stressing you, and re-assess it. So yes, a lot of these are easier said than done. And they may not be the right approach for everyone - often I struggle to do some of them, when the stress gets really bad. But personally, I find myself feeling unhappy, tense, and grumpy when I'm stressed out, and I don't think it's healthy at all. So finding ways to alleviate the stress is important, and these methods are not just for feeling less stressed, but for feeling relaxed and calm, making it easier to tackle the work, and making me feel happier and healthier. 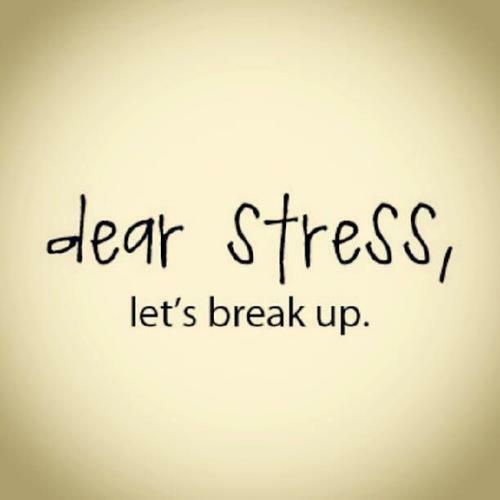 Do you have any other ways of dealing with stress? Let me know your ideas!